Kreator is to German/European thrash metal as Metallica is to American thrash metal: one of the great progenitors of this classic sound that changed and continues to influence the landscape of heavy metal. Kreator has never had the global commercial success of its American cousin, but they are still revered, and rightly so, as one of the greats of thrash. 'Hordes Of Chaos' is their twelfth studio release and first since 2005's massively crushing and well received,'Enemy Of God.' Expect more well crafted, sometimes wickedly brutal and often unpredictably melodic, thrash and heavy metal on this disc. For bone crushing and speedometer blowing traditional thrash, look no further than the opening title track and its medulla splitting guitar solos. Warcurse follow and keeps the blistering pace. In the same vein, another wickedly wild number is 'Absolute Misanthropy,' which, above all other numbers on this work, is the point of the thrash metal spear. All three pieces are bound to give whiplash to the toughest headbanger. But not everything Kreator creates on 'Hordes Of Chaos' is a speeding knuckle punch to the face. Being veterans and craftsman, they won't simply deliver thrash after brutal trash (as most modern heirs are doing). No, Kreator blends the urgency of thrash with some great melodic heavy metal (emphasis on 'heavy'). And frankly, this is where Kreator blows their young contemporaries out of the water. 'Escalation,' 'To The After Burn' and 'Demon Prince' are amazing compositions that seamlessly blend the best of melodic metal with the intensity of thrash. Each song builds with anticipatory intensity until it grabs your throat and throws you down. For fret work, the guitar solo on 'To The After Burn' mind-boggling good and on 'Demon Prince' just crazy fast. Very few young modern, so-called thrash heirs, can match the craftsmanship here. 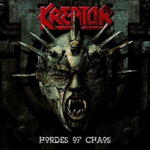 On 'Hordes Of Chaos,' Kreator shows us how thrash is done. This is modern thrash metal with timeless roots demonstrating musical brilliance and sophistication. Every upstart young metalcore band should take note and go to school. All this makes me want to visit my early thrash roots. On 'Hordes Of Chaos,' Kreator shows us how thrash is done. This is modern thrash metal with timeless roots demonstrating musical brilliance and sophistication. Every upstart young metalcore band should take note and go to school.